Home › 5 Pack Cable Management Sleeve System Kootek 19.7'' & 39.4'' Neoprene Cord Co..
5 Pack Cable Management Sleeve System Kootek 19.7'' & 39.4'' Neoprene Cord Co..
GREAT VALUE 5 PACK - 4x19.7" and 1x39.4", it is great value at low price for 5 premium cable management sleeves and perfect as a gift. EASY ACCESS: - With a zipper closure you can just wrap all the cords and pull them together zip and done. Never worry about finding the right cable to unplug again, the zip-up mechanism gives you pain-free access to your cables anytime. DURABLE MATERIAL AND MUTI-FUNCTION- The seams and neoprene are very strong and good quality for years of use. It can also wraped on steering wheels or carriage bars to add comformt. PLENTY OF ROOM- The sleeves are long and wide enough for all types of cables like USB, ethernet, HDMI, DisplayPort, power cables, etc. You can zip two together into one big one for larger bundles. DIY BY YOURSELF: Cut slits to run cable out; Ideal for home, office or working shop - No need to worry the messy tangled cords depress you or trip your kid. All cords are wrangled up and hided in one sleeve from sight, it makes your living and working space look more organized. GREAT VALUE 5 PACK 4x19.7" and 1x39.4", it is great value at low price for 5 premium cable management sleeves and perfect as a gift. EASY TO USE Just bind the cords together, wrap the sleeve around and zip up. The zip-up design is better than velcro version, convenient for you to add and reduce cables at anytimes. DURABLE MATERIAL Thick heavy duty flexible neoprene material makes them wrap multiple cables without any difficulties and live longer. THE MOST DIVERSE WIRE MANAGEMENT SLEEVE Being a great cable management system, it can also wraped on steering wheels or carriage bars to add comformt. And zip 2 sleeves together will accomodate double the amount of cables. 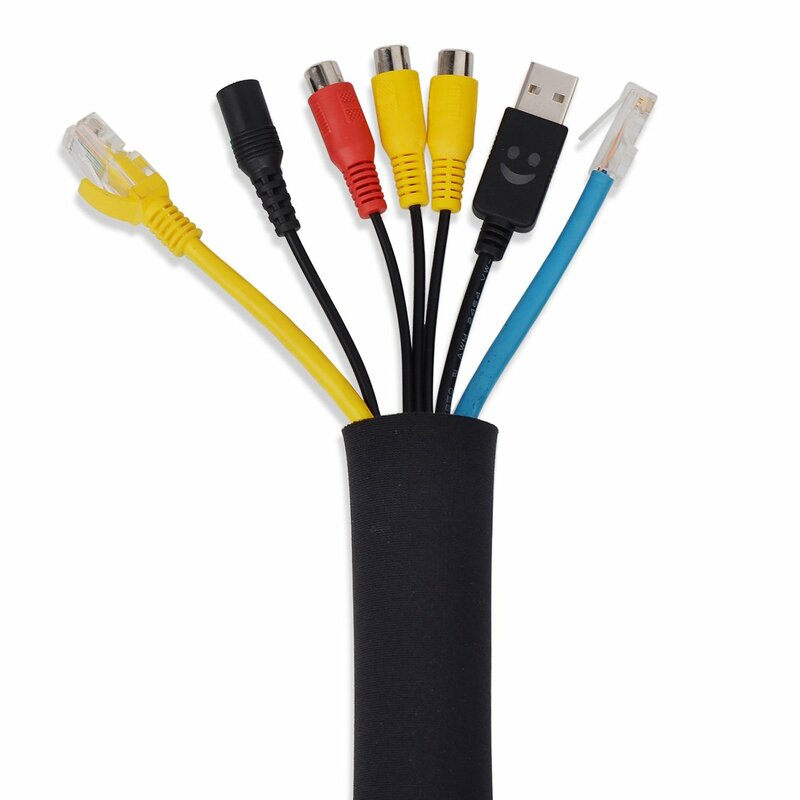 IDEAL FOR HOME, OFFICE OR WORKSHOP With kootek cable sleeves, no need to worry the messy tangled cables depressed you or trip your kid. Perfect cable management system for power cords, USB cords, cell phone chargers, audio cables, headphones and any other wires at home, office or workshop.